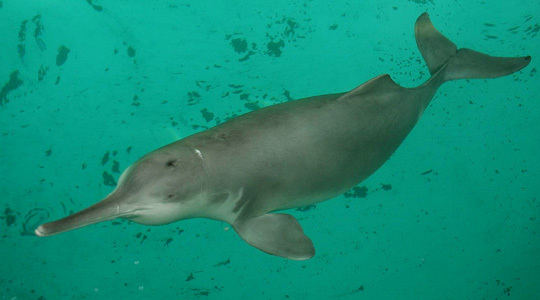 The Indus River dolphin (Platanista minor) is one of the world’s rarest mammals and the second most endangered freshwater river dolphin. Approximately 1,100 specimens of this species exist today in a small fraction of their former range, the lower reaches of the Indus River in Pakistan. However, the population of this species has gradually declined because of various factors, including water pollution, poaching, fragmentation of habitat due to barrages, and dolphin strandings in the irrigation canals. Numbers have dramatically declined since the construction of the irrigation system in the Indus. Most individuals now remain in a 1,200 km stretch of the Indus River (WWF). Formerly ranged throughout the 3,500 km Indus river system in Pakistan. Now, restricted to less than 700 km of the Indus River, Pakistan. A 2001 survey resulted in a population estimate of approximately 1200 individuals. Indus river dolphins are essentially a blind species; they have tiny, non-functional eyes that lack lenses. They use echolocation to detect food and navigate, and – to a very small extent – for communication. They are top predators of freshwater ecosystems in South Asia and hence serve as a reliable indicator for healthy ecosystem. They can act as population trend indicators in degraded freshwater systems. The species is threatened primarily by the damming of rivers for irrigation and electricity generation, which degrades habitat, isolates populations and prevents seasonal migration. The construction of three irrigation barrages, completed at Sukkur in 1932, at Kotri in 1955, and at Guddu in 1969, has had a devastating effect on the species. The species is very similar in appearance to the Ganges River dolphin (Platanista gangetica). These two species are the sole survivors of an ancient and diverse family of cetaceans. The Indus River dolphin is generally found alone or in small groups in the deepest channel of the Indus River. Its range has drastically decreased over the past century as a result of the construction of irrigation barrages (low, gated diversion dams), which have fragmented the population, and reduced available habitat by depleting the volume of water flowing downstream. The species is legally protected throughout in its range. It is listed on Appendix I of CITES and Appendix I of the Convention on Migratory Species (CMS or the Bonn Convention).